I must be losing my mind! Again! My Teacher is a Zombie is free all week! Yes. From RIGHT NOW until Friday, you can pick up the first in the Supernatural Learning series totally free! You don’t need to have a kindle to get a copy. If you need help learning how to read ebooks, contact me and I’ll help you as much as I can. If you don’t do kindle (or Amazon) let me know and I can hook you up with an epub version that should work on nearly any other reading device. What are you waiting for? Go get yourself some Zombie Teachers! And thank you for your support! P.S. Last week I gave away 56 copies of V&A Shipping. If you didn’t get a copy, let me know and I’ll email you one! Yesterday was a good day. I’m nearly complete with My Teacher is a Werewolf. I’m in the wrap up part of the story and I plan on introducing a little something that’ll carry over into the next story.I do intend to continue with the series. These characters are just too much fun to give up on now. The pacing is right, the flow is right, the interactions are fun. The entire thing just works. My friend and I were at Denny’s. At the time I didn’t drink coffee (I only did for a short time in the Navy). We both had lighters, but didn’t smoke (I didn’t start that until I was in the Navy and quit 6 years later). We had issues with lighting things on fire. Small things we could watch burn. We even turned lighters into rockets by lighting one end on fire. We cleaned out the packs of sugar and non-dairy creamer. Not sure to this day why we did that. I know we used to do sugar shots (something my favorite daughter now does). As for the non-dairy creamer, well, I think we took them just to take them. Later that day we were setting empty sugar packets on fire. We melted a pile of sugar. We lit a pack of non-dairy creamer on fire. All of this was very non-exciting, but made us giggle. Until that fateful moment when my friend put some non-dairy creamer in his hand and tried to lite it on fire. In his hand. Yeah, we weren’t the brightest tools in the shed. Of course he burned his hand and when he felt pain, he threw the non-dairy creamer. If you know anything about non-dairy creamer and fire you can imagine the result. It wasn’t a lot, but the small, crackly fireball was cool enough that we went through all the packets of non-dairy creamer very quickly and needed to get more. I looked down and saw the column of fire climbing quickly toward me. Being a sensible kid, I threw the remaining non-dairy creamer into the air to make sure it didn’t get on me. Side note, this was in the day before cameras in schools and inefficient fire systems. I hit the deck as the billowing mass of non-dairy creamer erupted into a giant fireball. I could only watch and laugh nervously as it rolled across the ceiling. My friend, wise as he was, ran up the stairs. He and I did our best to look nonchalant as we double-timed it to the class we should have been in. We were only in there for five or ten minutes before the bell rang and everyone poured into the hallway. It was difficult not to laugh as people exclaimed about the disgusting smell in the hall and wondered what had happened in the science class. It may have only been the two of us that noticed the large black stain on the ceiling. I’ve known about non-dairy creamer since the 80s. So it was surprising when I watched the mythbusters episode where the created a non-dairy creamer cannon. I can’t remember the last time I laughed so hard during an episode. Sure they’re always filled with laughs (square wheels, 55 gallon drum rockets, well almost everything they do on the show), but this one struck home with me because I’d been there. Done that. Just not nearly as large as they did. Here’s the video. http://www.youtube.com/watch?v=yRw4ZRqmxOc. It’s funny how something so mundane can get your brain running in an entirely different direction. Today I was going to blog about ducks. Perhaps I’ll do that tomorrow. Daily Update: It’s the little things. I’ve always heard bigger is better. To an extend I subscribe to that concept. But big things can come in small packages. Take for instance two little things that can in the mail. One yesterday and one today. Both made me extremely happy. The first was a 32GB USB drive. It’s actually smaller in size than the 4GB I was using, but it’s bigger where it counts. Of course I’m only using a very small portion of its capacity, but I’ll figure out what to do with it. The other little item I got is even smaller. It’s a 32GB Micro SD. I have a xoom tablet that I use for everything these days except for writing. I had filled up a 16GB micro sd card and have made some music and video purchase I wanted to include on the card. It’s, obviously, the same size as the 16GB in physical dimensions, but with twice the capacity. Now why did I buy myself a couple little things? I felt like I deserved it. Why did I deserve it? Because I hit my one third mark. I’m now 150,000 words into my 2012 goal. I bribed myself with a couple little gifts for hitting a goal. A little less than half of those words are new fiction, the rest would be blog posts.I can’t remember the last time I’d written this many words in a year and I’m just getting started. I’ve got big plans and here’s what I’m planning. I’m going to finish up My Teacher is a Werewolf. I’m only about half way with that one, but should be able to knock it out quickly. I need to record the next episode of Golden West. That story is really shaping up. Left off on a couple good cliffhangers. Then I’ll be starting Of Gnomes and Dwarves. As much as I hate to do it, To Fall From the Sky just isn’t going where I want, it’s not keeping my interest right now, and it’s slowing me down. I need to get into a work that’ll excite me again and get me fired up to sit and write. Speaking of getting fired up, I’m getting a little ahead of myself here. I’m going to do the complete read through/edit of Jack Kane and the Statue of Liberty. I won’t count that 100% toward my word goal, but I will count the edits/rewrites as 1/4 word for each word edited. So I need to edit at least 5000 words per day to hit my writing goal. I think I can manage that. Once those edits are done, I’ll fire that over to Mike who’ll give it his once over and then it’s off to Beta Readers. Only then will I begin Of Gnomes and Dwarves. I love everything about those books. I know that I love them more than they deserve as the writing is utter crap. I’ve done some reads of the start. It’s bloated, very slow in parts, even slower in the beginning, but has a great story to be told. I won’t be changing the story much, but I will change how it was written, paced, and make it a stronger story. I started it over 20 years ago. I think I’ve gotten a little better at this writing stuff. Once I finish with that, I’m going to write the sequel to V&A Shipping. No, I haven’t gotten the first picked up by a publisher yet. I had told myself long ago not to write any sequels until I’d gotten the first in a series published. But I’ve got a wonderful idea for the sequel and it’s just begging to be told. If you liked the first, I’m sure you’ll enjoy the second. My plan, after those two, is to write the sequel to Astel. Again, this is a sequel that’s been banging on the side of my head for years and needs to be written. I put out Astel over a year ago and many people have asked where the next book it. It’ll be there soon enough. That’s what I’ve got scheduled for the near future. I’m not going to try and plan too far out. I might sneak in another My Teacher is a… depending on how the second is received. My Teacher is a Zombie has gotten good reviews by those who’ve read it, but sadly sales aren’t there. I know I need to do a lot more about this self promotion stuff, but I feel I need a bigger body of work for people to pick and choose from. I still have a couple short stories out there that I’m waiting on edits for. I have covers. They’re awesome! Once I get the edits, the ebook will be assembled and BANG! Out there. Daily Update: Good writing day. I had a good writing day. I clocked just under 2500 words. I may miss my Lent goal, but I’ll get darned close. I’m still hoping for a couple really good evenings of writing to try and get there. If they happen, they happen. If not, I’ll do the best I can. Life will always present obstacles. I just need to keep pressing forward and not be disappointed. After all, I’m now 14 days ahead of my annual goal. Still on target for 500,000 on the year if I keep going at the pace I’ve set. We’ll see how it goes. One thing I’m going to do is step up the amount of fiction I’m writing. I’ve written a lot of blog posts (and some lengthy ones) but I need to really get more fiction written. Either way I’m pushing 120,000 words on the year and I’m quite happy about that. Dan Dan the Art man has provided me with a couple new covers for short stories. Once I have edits done on Don’t Eat the Bread and Moving at the Speed of Though I will get those out there. The covers are awesome! I’m currently working on My Teacher is a Werewolf. Again I’m having fun with this one. There are lots of little bits that make me laugh and when I tell my daughter what I’m doing she also laughs. I’m hoping that’s a plus. It’ll be a little scarier than My Teacher is a Zombie, but then it must. Werewolves are scary, right? I’m not going to make it too intense. There’ll still be a lot of funny moments. The way this one is looking it’ll end up longer than the first. I’m still trying to name this series and I’m thinking about going with Unnatural Learnings. Let me know what you think. On a plus note: I’ve been doing a little dieting. I’m down a few pounds. Quite happy about that. The better diet is helping me keep my head clear so when I do sit down to write the words seem to be coming easier. I think that plus the combination of sitting down every day and writing is helping me get words out in a more efficient fashion. I’m still a slave to my word count spreadsheet. I love to toy around with it. I don’t modify what I’ve done as far as numbers. Those are written in stone as far as I’m concerned. I just have fun with the formatting, graphs, percentages, adding new columns to show progress and the like. I think I spent an hour yesterday goofing around with it. Then inspiration struck and BAM! Knocked out some words. I won’t be doing that tonight. Tonight it’s all about word count and I’ll be hammering on the keyboard as quickly as I can. Daily Update: Today is a good day. Initially I was Sneezy and Grumpy. I took my Doc’s advice and was Dopey and Sleepy. What I really want it to be Happy. Heck, I’d even been glad to be Bashful. Today is a good day. My sinuses are feeling a little relief. It’s dark, it’s a little chilly (I’m still wearing shorts and a t-shirt) and it looks like rain is on the horizon once again. My nose, on the other hand (or would it be other face, hmm) is red, raw, and sore. My ears hurt from all the nose blowing. The residual headache is a bother, but hey, I’ll get over that. At least I don’t have a leaky nose. Well, not as much as it was. Yesterday I wanted to go see my best friend’s daughter run track. She’s really good at the hurdles even though she’s only just begun. She’s got those crazy long legs. Being that I used to run track, I miss watching all the events. I will make it to at least one of her meets this season. I also missed my favorite daughter’s volleyball practice. Hearing her talk about it, I missed a good practice. I will be practicing with her later today and a little tomorrow. She’s got a tournament on Sunday and I want her to be prepared. From what she told me, she will be. I’ve wanted to record. I think I’ll do that tonight or perhaps tomorrow. I need to record the latest episode of Golden West for the Action Pack Podcast. I need to record my story for Tee and Pip. I need to record the promo for the Action Pack. Unfortunately with my head as congested as it is (was) it just wasn’t going to happen. Even though I had an awesomely low voice because of all the snoring I’ve done the past couple of days, I couldn’t make it though more than a few words without coughing. That would have been an editing nightmare. On the plus side, I knocked out 2500 words yesterday. Most of that in My Teacher is a Werewolf. This will be the next story in the Teacher series. I need to come up with a good title for the series. Something like Unnatural Teachings or something like that. I’ll give it more thought. I plan on doing more of these stories. Why? Because they’re fun to write and I can get into the story quickly. This one might be a little longer than the first, but hey, I’m good with longer. I already like where the story is going and I’m confident I’ll plow through the first draft quickly. If I’m lucky, I’m past that little sticking point. I didn’t like struggling to write words. I still wrote every day and I know why some people might not write while sick or when they don’t feel well. But I’m happy I did it. I worked through a difficult time and I have more words. Even if some days it was only a slight amount, it was still words I didn’t have before. Speaking of words, I’ll be doing NaNoWriMo. That should be no surprise. But I found something called JuNoWriMo. It’s basically NaNoWriMo in June. I’ll do both this year. My goal right now is to work on Of Gnomes and Dwarves book 1 in June, edit it in July, and work on Book 2 in November, and edit it in December. Then I’ll release those in 2013. Possibly sooner depending on how I feel about where the stories are at. Each book currently is at around 60,000 words. Both I wrote very quickly on the first draft so I’ll use those plot outlines as a guide, but I’m going to completely re-write them both. Oh yeah, so I mentioned the other day I was helping my favorite daughter and her friends shoot a video. The video was for a project. I helped with the acting by dying twice, getting dipped in ketchup, and rolling in the wet grass more times than I would have liked. I was also the only one to do a ‘costume change’ because of the aforementioned ketchup dipping. Want to see what the final product looked like? In happier news, Kance Encounter is available everywhere. You can name your own price over at smashwords (even if you want it for free). It’s .99 everywhere else. Same goes for My Teacher is a Zombie! That’s right, Dan Dan the Art man did an awesome cover for me and I’m all kinda excited about getting that one out there. Check either of them out, let me know what you think. Here’s the link to my author page where you can see all my smashwords titles. You can also pick up the titles from Amazon or B&N. If you hit the Amazon of B&N link look for me as some of the titles in the search aren’t me. It’s funny some of the titles that actually show up. 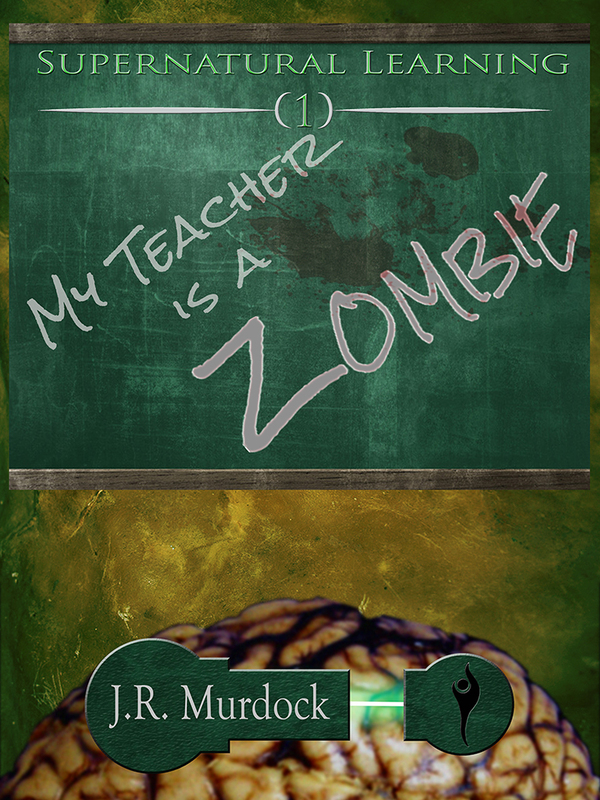 My Teacher is a Zombie is getting a lot of hits, very few sales. I’ll let you know if that picks up. I’m just excited to get that one out there. I’ll be doing more in the series so let me know what you think. You’re still thinking about that video, aren’t you? Work has been crazy busy. Taking lunch to type this up. Things won’t be slowing down any time soon either. Ah well. Writing has been difficult. I’ve got a scratchy throat. Not sure where it came from but I hope it goes back there. It’s made breathing painful and swallowing unbearable. It’s an annoyance that I don’t need and it’s kept me from getting down as many words as I’d like. That combined with many personal things to deal with (shooting the video, the editing, special effects, sound, etc) and getting my favorite daughter registered early for her classes next year. There have been a lot of distractions. I’ve still managed to get a good number of words down, but far less than I’d hoped. I’m falling further and further behind on my Lent goal. I think I’m at 82% of my goal to date. I’ll have to work on getting that number back up. Even with being down on my Lent goal, I’m still 10 days ahead of my annual goal. Perhaps I’ll get a big block of time to really knock some words out, now that I’ve got that video edited and all. Ok, ok, you keep bringing up that video. Here it is. I set a goal and I intend to keep it. It took some extra writing, but I’m now just slightly ahead of my goal (1 day ahead, but ahead nonetheless). Over the past few days I averaged just under 2000 words a day. Now that I know I can do 2000 a day, I am going to try and keep that pace for a while and see where it takes me. Obviously I need to get some editing time in there and I will manage that as well. The lost boy returned home. I’m very happy about that. I still have no news. I will likely have a special update later today. Other than my arm being sore from throwing a volleyball around for the past few days, I got nothing. Keeping it short today. Unless you want to hear about a dream I had? You do? Okay then. In my dream I was a middle-aged man (not a big stretch there) and I had a family much like my own with a wife, one daughter, and two dogs (this was scarily close to reality). Only in my dream I was retired. But from what? I got a call from my old team mates. They wanted to get together for one last adventure. I tried to inform them that I wasn’t in my prime anymore and I probably didn’t even fit into my suit. They said they didn’t care. It was TIME TO RIDE! That was all I needed to hear. I suited up in my silver suit, put on my helmet and went to the basement. The entire house, on rollers, moved aside so I could launch my weird falcon/eagle/bird looking ship and head off for the moon. Some evil-doers had gotten up there and was causing a ruckus and it was up to my team (a name never formulated in my brain) to stop him. As it is in dreams, it was fun. It was fast. It was over before it was over. I woke up before we got to the moon. It did stick in my brain though and I might have to write this one some day. Might be a fun short. And that was my dream. I wish is had been more exciting. Perhaps you can take this as a writing prompt of your own. If you do, let me know. I’d love to hear how the story ends.